Pres. 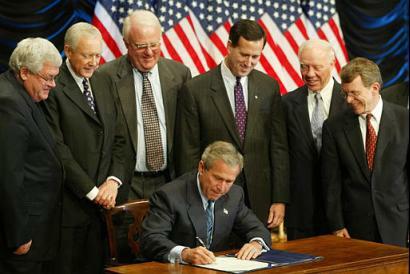 George W. Bush signs ban on late-term abortions. Over the past few weeks --- since the U.S. Supreme Court ruled against them --- there has been a great deal of press about third trimester terminations of pregnancy. Those who are in opposition label these events as late-term abortions, or destroyers of life. Nowhere in the reams of paper, electronically conveyed arguments, on-air discussions is the argument made on behalf of the pregnant woman’s life. It is as if she is merely a container for a not-yet-born baby, and we need to concern ourselves only with the life in utero. Never mind the view in some religious teachings that life begins at birth. Never mind that the life of the mother takes precedence over the potential life of the not yet born child. Never mind if the in-utero being is causing a danger to the mother’s life/health. Never mind the mother’s life must be saved at the cost of the potentially birthed child. According to the majority vote of the Supreme Court Justices (where were the critical voices at the confirmation hearings of Justices Alito and Chief Justice Roberts?) this latter view does not hold water. Pardon the pun. According to that rather heinous ruling, the not-yet-born fetus takes precedence over the health of the woman. As a result she may not be able to carry a child to term? Too bad. As a result she may suffer various ails, there may be dangers to various systems in her body? Too bad. The health and well-being of a living woman does not hold up to the love these advocates have for the "innocent" new life. It is as if the vessel must be sacrificed to the infant. Heigl and Rogen in the movie Knocked Up (2007). If there are those among us who do not share this willingness to sacrifice the life of a living breathing woman for the potential of an in utero fetus we may count ourselves as followers of Talmudic thinking. In the awesome awful moments of having to make life and death decisions the Jewish tradition gives guidance. That does not mean that the guidance is easily, breezily given, or that there is not a strong sense of anguish at the need to make a choice in such a circumstance. Save the life of the fetus at the expense of the life or health of the mother --- she may be the mother of other living children who depend on her --- or save the life and guard the health of the mother at the expense of the not yet born fetus. Either choice is difficult, fraught with human cost. Make no mistake about that. But, and here we add a dimension that has been, as stated above, so sorely missing from the debate up to now. This is not a simple matter of choice. Choice here is not lightly made. It is a matter of life. On both sides of the choice equation is life. Whose life is the question. Those who would bifurcate the issues into "choice" and "life" are smearing people of conscience with a cheap paint. Should we say that those who would sacrifice the life or health of a mother to save a fetus to be born at a later date are not making a choice? Should we say that those who would save the life and health of a mother and necessarily sacrifice the possibility of birth of a fetus are not respecting and revering life? What we need to do, to protect society and the individuals who comprise it, is to bear in mind that life choices are weighty, and nobody, no group, has a monopoly on wisdom nor on decency. In our system of government certain decisions are to be left to the consciences of individuals in their organized social contracts. And may we exercise the wisdom to make those decisions decently.